I'm sure I recently mentioned how incredible the American Southwest is. In any case, it's pretty darn amazing. 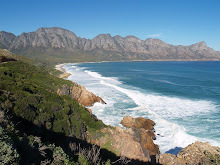 The truth is, when I look at the locations independently, I think to myself, "Gee, South Africa's Seweweekspoort was just as nice." But it's the sheer concentration of these stunning sites that takes your breath away. Within a 2-hour radius of Aztec, New Mexico, there are at least a dozen things that you just have to see. From the Aztec, Mesa Verde, and Chaco Canyon Indian ruins to Monument Valley and the Bisti Badlands - and let's not forget the jagged peaks of the San Juan Mountains (dotted with dozens of crystal clear lakes) with its National Forest and Animas River, weaving a whitewater path through the foothills and into charming resorts and villages (think Telluride, Ouray, Silverton and Durango). Drive a little further into the mountains (you'll need 4x4 for this), and you'll find various ghost towns with their telltale mines. There's skiing, climbing, ice-climbing, whitewater rafting, kayaking, fishing, and horseback riding - you name it, it can be done here. It has all the makings of a once-in-a-lifetime vacation. On Sunday, we headed up to Silverton, which is about a two-hour drive from Aztec. (This photo is of a pianist at an old-fashioned saloon on Main Street. How cute is he?!?) We stopped there for lunch at Romero's, a tasty, family-run Mexican restaurant, before heading up to the "Old-Hundred" Gold Mine for a tour. The 1-hour tour, taking us one-third of a mile into the mountain on an electric mine train, was super interesting, and we had one heck of a tour guide. 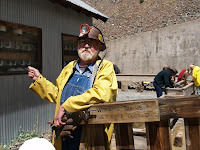 Having mined since 1959, he had a dry, old-timers sense of humor which I really got a kick out of. 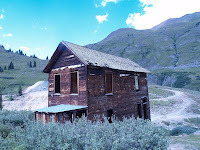 From there, we headed towards the ghost town of Animas Forks, passing by the site of the Eureka mines, along with the foundations of what was once a town. 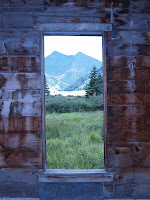 The drive up to Animas Forks was quite spectacular, and the historic old homes there have been preserved nicely. Life up there must have been very trying. Yesterday we went white-water rafting on the Animas River, using a Durango-based company called Rivertrippers. Although the river was fairly low, it was great being out on the river, and there were still a few rapids to navigate along the way. After rafting, we were ready for some serious food, so we headed down Main Street to the spot recommended to us by our Rivertrippers guide, a "New American" restaurant called Ken and Sue's. Although lunch was amazing, we were concerned that eating so late in the day would leave little space in our bellies for the Green Chili Burritos that Grandma was making for dinner. Fortunately, that didn't end up being a problem. When Grandma and Aunt Pam served burritos that night, we were prepared, and dinner was followed up with good conversation, a game of duck-duck-goose (Pam and her husband Steve have five kids, but the adults got in on the fun, too), and a round of Apples to Apples.